Frankly, we definitely prefer the edges of larger displays be Base-8, and we typically have enough brick to build to meet it if someone's not compatible. When Josh or I get word the table layout for the hall has been determined, that can help steer the way for how big or small individual pieces should be. Tom will probably bring his portion of the display. I would love to coordinate with the people next to me on either side to make this all fit. Tenativly speaking, I have a Yellow castle thing that I want to do, to add a bit of colour, you know. 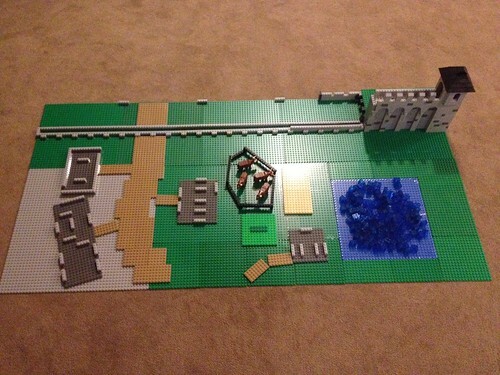 I think it will probably be in the vicinity of about 96x96 studs. Last edited by Elephant Knight on Mon Aug 13, 2012 5:15 pm, edited 1 time in total. I am coming and will have a forested area to contribute I hope. Size and shape TBD but can work with whatever is going on. So far it all sounds good! I am not even going to attempt a layout plan yet, but we should have no problems incorporating at least parts of everything people have mentioned. It would be helpful to me if the people who are building AOE work together without my mediation and then give me the estimated size. Same would be nice for anything LCC related, since I assume you want any LCC MOCs displayed together. As for standards, I don't force anyone to use certain standards. But if the co-op layout uses base8 edges and sizes, so that everyone can match up. Ok, sorry for the late notice but I'm going to be able to make it this year. I'm short on time to begin building but I'm sure I could put out 2-3 32x32s. What do we need for the layout? Are we short on village MoCs or Walls? Beaches? Forests? A bit of disappointing news: I don't believe I will be able to finish my large display in time. I haven't had enough time to work on it, and I've been busy with many other issues recently that have taken time away from my LEGO projects. The plan right now is to build something smaller, probably a 64 x 64 stud landscape, and lots of filler for helping the other layouts out. I still want to do the large display I've planned, but it may be next year instead of this year. I will post another update if this changes. Thanks, and sorry about that! Got to keep my priorities straight. Jubal - Sad you won't be able to finish your MOC in time. The one you had last year would have been tough to top though!! Here is my layout that will go next to Fraslund's on the Left side. He is going to build a bridge across his river that will lead straight out through the gatehouse of my wall. The other stuff shown is just to get an idea of building footprints and general layout. The right side of the picture is the side that will front the audience. Ok, I've got a 32 x 32 of adventurers gathering outside of a cave. It should be finalized within the week depending on how rough it will be to do lighting. I'm planning a pub. right now it's 32 x 32 the more details I think about the more it starts to look like it might go into a second 32 x 32. I'm also not sure what the interest level is but I have a handful of the old Castle Orks riding on the new Dino dinosaurs. They're not set in anything particular and could be thrown into a battle scene pretty easilly. They've ended up looking pretty decent if you guys want me to bring them along. CreativeAnarchy wrote: Ok, I've got a 32 x 32 of adventurers gathering outside of a cave. It should be finalized within the week depending on how rough it will be to do lighting. I'm planning a pub. right now it's 32 x 32 the more details I think about the more it starts to look like it might go into a second 32 x 32. I'm also not sure what the interest level is but I have a handful of the old Castle Orks riding on the new Dino dinosaurs. They're not set in anything particular and could be thrown into a battle scene pretty easilly. They've ended up looking pretty decent if you guys want me to bring them along. Are we doing the massive fig battle area like we did last year? AK_Brickster wrote: Are we doing the massive fig battle area like we did last year? I'm totally spacing out, for the cooperative build are we doing brown or tan road sections? I believe the standard is tan or dark tan?